Not only are we running trips on the South and Middle Forks of the American River, but we are also running guided rafting trips on the Goodwin Canyon run of the lower Stanislaus River in late October. This post and the map have been updated to reflect this. 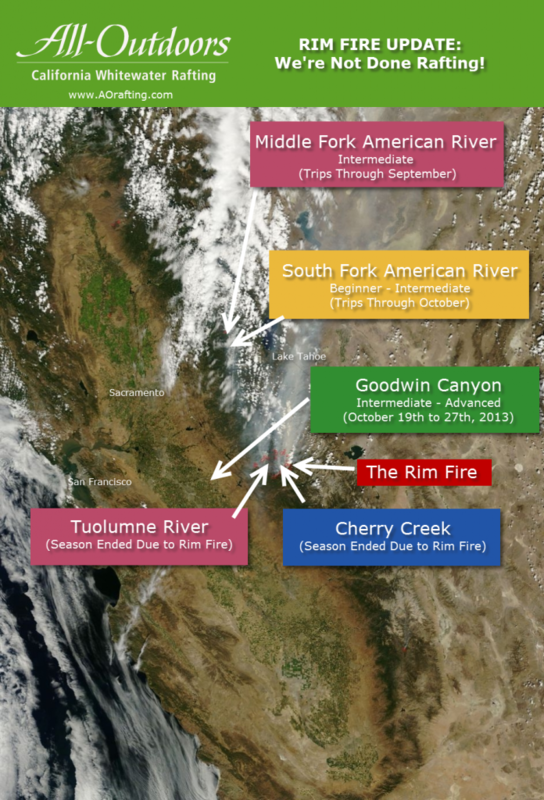 Wondering how the American Fire near Foresthill and the Rim Fire near Yosemite National Park is affecting river rafting trips in California achat cialis pas cher? The short answer is that we are thankfully still in full swing on the South Fork of the American River (until the end of October), the Middle Fork of the American River (through the end of September), and on the Intermediate-Advanced Goodwin Canyon run in late October. Yes, there is plenty of very bad news in here; but there’s also some very good news: we’re far from done playing on the river. The 2013 California Rafting Season Continues! In fact, this week we launched a new Facebook Sweepstakes for a chance to win a whitewater rafting trip for two people on one of these rivers! We will pick a new winner every week; all you have to do is enter once, and you are automatically registered for a chance to win every single week until the sweepstakes ends at the end of September. All you have to do is Like our Facebook page and submit your email address so we can notify you of the results. So whether you’re thinking about a trip this fall, or want to wait until next Summer, you might want to sign up now. Looking for a bit more whitewater excitement closer to the San Francisco Bay Area? This is one of our guests’ favorite day trips, due to the short drive and high adventure waiting for those who choose to take advantage of the late Fall water releases from the upstream dam. This canyon is unlike any other we explore, and it doesn’t run very often. If you haven’t checked it off your California River Top Ten list yet, late October will be your only chance to get it done. Take a look at our Goodwin Canyon photos and river description page to see if you and your friends are up for it, or call 1-800-247-2387 to talk it out with one of our river specialists. Unfortunately, the Tuolumne River and Cherry Creek canyons are currently closed to public access, and we have cancelled the remainder of our scheduled trips there for the season. Gregg Armstrong recently detailed what we know about the impact to these canyons, and in a follow up post he describes All-Outdoors’ first-hand account of evacuating from the area last week. As soon as we are allowed to enter the canyon, we hope to report back here with our observations on the after effects of the fire. While we don’t yet know the extent of the damage, we are very hopeful of the long term recovery of the watershed, its ecosystem and our own future return to a place we have long considered our home. If you are currently booked on the Tuolumne or Cherry Creek, or reservations staff has either already contacted you, or will be notifying you soon regarding your trip. You can also contact us if you have any questions.